Find out how Winn 50 can safely get you bigger muscles while you also get rid of excess body fat. There a lot of Winn 50 reviews online, but that shouldn’t be surprising. That’s because many serious athletes and gym goers have come to realize 2 basic facts. One is that they need supplements so that they can achieve the fitness goals they’ve come to set for themselves. It becomes apparent after a while that it not’s enough to simply eat nutritiously and work out regularly. The other fact is that anabolic steroids, for all their documented benefits, are also quite dangerous. One of these steroids is Winstrol, and it’s among the most well-known. It’s been in use in the industry since the 1950s. However, since then it has been banned for general use. Nowadays you can only get it on the black market, or if somehow you can get a prescription. Even a pro-steroid anabolic research review will admit that Winstrol requires a lot of thought and care when you take it. It’s notorious for really messing up your cholesterol levels. It severely lowers your good HLD cholesterol level while it increases your and LDL cholesterol. It also reduces your body’s capacity to produce testosterone naturally, so you invariably end up with low T levels unless you stack Winstrol with shots of testosterone as well. It’s also dangerous for the liver. Winn 50 is a much safer alternative, and it’s easy enough to buy over the counter or online. It’s certainly a more affordable option too. It’s designed to provide all the benefits of Winstrol without burdening you with the accompanying side effects. This comes with beneficial vitamin B12 to metabolize your carb intake. It also contains iron, and one of its functions is to help make sure that you’re getting enough oxygen to your muscles when you’re working out. Its main active compound is the Vanazolol Proprietary Blend, with a hefty total of 356.35 mg. As it’s a proprietary blend, you won’t know the specific dosages of each ingredient. But at least you do know what Winn 50 ingredients are contained. Here you get caffeine, which is a very popular stimulant contained in many workout supplements and drinks. It gives you that extra energy for working out, and it even helps to boost your metabolism. It also helps with your body water problem, as caffeine is a well-known diuretic. Then you have dandelion root powder. This works in conjunction with the caffeine in preventing water retention in your system. It allows you to gain muscle without having to also gain too much water in your body. This blend also contains DHEA, and it helps to bring your testosterone levels back up naturally. DHEA is a precursor to testosterone. Your body produces DHEA naturally, but after the age of 40 you don’t produce as much DHEA as you did before. A deficiency in DHEA can lead to problems with inflammation and an increase in the risk of cancer and heart problems. Low DHEA levels can make your immune system weaker. The final ingredient in the blend is Vanadium. This enables your muscle tissues to sue more of the protein for muscle building. This also regulates your blood sugar levels, and it’s a crucial advantage when you’re in your cutting phase trying to get rid of excess fat while you try to retain the muscles you’ve gained. First of all, let’s address the most important question: is Winn 50 safe? It’s fair to say right out that there aren’t any serious Winn 50 side effects to worry about. For the vast majority of people who will take this, it’s perfectly safe. There’s just one thing—it contains caffeine. This means that if you’re especially sensitive to caffeine, then it’s not for you. It may cause to feel the jitters, and it’s even possible for you to feel overly anxious because of the caffeine. If drinking a single cup of coffee is bad for you, then Winn 50 isn’t really ideal for you either. If you’re already a heavy coffee drinker, you may want to cut back on your coffee intake as well. You may end up with too much caffeine in your system, and that can also lead to problems. Aside from the caffeine issue, there isn’t anything else to worry about. As long as you follow the directions, you shouldn’t have any issues. Just take 3 capsules daily at the most, and space each time you take a capsule with several hours in between. Stick to a 30-day cycle, and then take a short break before resuming another Winn 50 cycle. This is safe to use with other stacks as well. Anabolic Research includes this as part of several stacks they offer, which include stacks for the cutting phase, a speed stack for athletes, and even a stack for people who want to look good for the summer season. Basically, it turns your body into a virtual fat-burning oven so that you consume calories at a faster rate. This will mean that if you’re dieting, you limit your calorie consumption. Your body’s increased capacity to sue up calories makes it more likely that it will burn off your stored fat cells to get the energy the body needs. If you’re trying to get rid of your flab, this’ll help. This helps too, and its main advantage is that it allows you to get the bigger muscles you want without becoming too big and too heavy. You won’t bulk up, so you can maintain a slimmer physique if that’s what you want. This is also a crucial advantage if you’re an athlete who competes in a sport with weight classes. You can keep your weight down while you boost your strength by developing bigger muscles. Those who require agility and speed will appreciate how this keeps you from bulking up which can slow you down. It also increases your muscle stamina and endurance, so you’re not as quick to get tired. For sports like basketball, this is a tremendous advantage, as you can perform just as well during the last few minutes of a close game. For those who work out regularly, these advantages of strength and endurance can really optimize workouts. You’re able to life heavier weights, and you can do more reps and work out for much longer. All that improvement can lead to bigger muscles and greater strength. If you’re a runner or a biker, then your greater stamina can help you run or pedal for a longer period of time, and that too can provide greater cardiovascular benefits and greater weight loss. If you just want to look good with a toned body, then this works effectively as well. Keep in mind that it offers lean muscle gains without an accompanying weight gain. In fact, it helps you to get rid of the water in your body as well as the excess fat. Shedding all that water and fat leaves just your muscles in evidence, and they can look especially appealing without all the flab around them. If you want a beach-worth body, then Winn 50 is a good way to go. The other main benefit of Winn 50 is that it helps you recover from your workouts and training. Part of actually building muscles is to recover properly when you’re done working out. When you lift weights, you put in micro-tears in your muscles. Your body reacts by rebuilding those tears with your protein intake, and this happens when you’re recovering from your workout. It’s especially important that you allow your body to recover properly by allowing it enough time. But this can lead to some conflicts, when you have a strict workout schedule or a game to play. You may end up straining your body even while it’s not yet done rebuilding your muscles. That’s where Winn 50 comes in. It speeds up your strength gains and it can shorten your recovery time. Some people who take this supplement have even reported that they’ve cut their recovery time in half. This enables you to work out more and you can avoid stressing your muscle by working out or performing in sports when you’re not yet done with your recovery. All in all, it just makes sense to take Winn 50 if your fitness goal is to build muscle without bulking up. Take it if you’re trying to lose excess fat, or if you want to improve your athletic performance. It’s perfectly safe, it’s much more affordable than anabolic steroids, and it’s certainly effective. 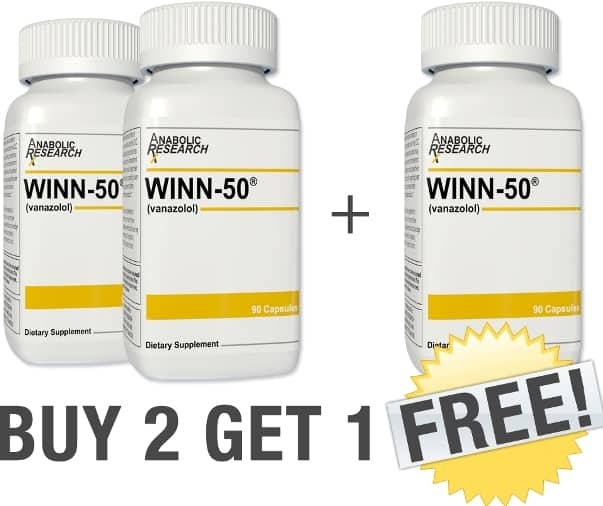 Among the many supplements for cutting and for muscle gain without weight gain, Winn 50 is a definite winner.